In the digital era, even companies that have distinguished themselves as disruptors cannot afford to rest on their laurels. If they do, they face the chance of being disrupted themselves. 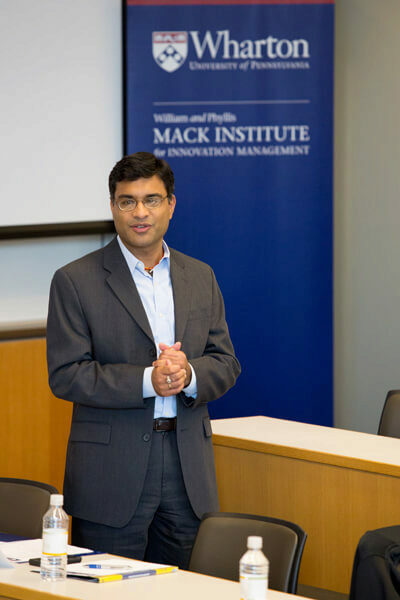 Mack Institute executive director Saikat Chaudhuri examines this issue in his latest white paper, co-authored with Mack Institute research associate Pragna Kolli, titled “Navigating Digital Disruption: How to Thrive Through Innovation Management.” He recently discussed the paper’s conclusions on the Knowledge@Wharton show on SiriusXM Channel 111, Business Radio Powered by The Wharton School. Knowledge@Wharton: Tell us about the paper and what you were looking to accomplish? Saikat Chaudhuri: If I may take a minute and just let people know about the Mack Institute, it will give the context. [Our focus is] on innovation management. Our mission is to promote thought leadership on managing innovation but also applied to practice…. What we really focus on is less the startup phenomenon, and more what the established industry leader faces. All these firms you hear about that are at the top, including the likes of Google, are no longer the agile disruptors but are being challenged by others. I have to give a shout-out to Pragna Kolli, who’s a research associate at the Mack Institute and an MBA alumna of ours. She did a lot of the heavy lifting for the paper. Now, to your question. I think that delving into it, digital disruption is something that’s across the board, across sectors affecting all kinds of firms. What do we mean by that? We have the cloud, we have big data, we have automation, we have artificial intelligence, robotics, additive manufacturing, mobility. What’s important about that is they are fundamentally changing the nature of products, processes and business models across different firms and industries, thereby posing a challenge but also an opportunity. Knowledge@Wharton: But if you look historically, this disruption is not something that’s catching people off guard. If you go back 30, 40 years when the computer was just coming out, that was disruption. That truly was catching people off guard. Isn’t this something different? Chaudhuri: It is. I think you’ve hit upon two points that would seem perhaps paradoxical to people. On the one hand, digital disruption is another form of disruption. In that sense, there’s a lot we can learn from past disruptions. Disruptions happen from time to time. Each one has its unique flavor, and this one happens to be based on digital technologies. When we moved from vacuum tubes to semiconductors, that was a revolutionary technology that changed the course of the semiconductor industry and computing. What’s different about this is we can see it happen. It is nonetheless challenging. In some sense, people would argue it is more challenging because the pace at which the developments are occurring is different. A lot of incumbents are being displaced. Just look at the taxi industry and what Uber is doing to them, or the hotel industry and Airbnb. That’s just on the front end. In the medical fields, we have things happening. In fintech, you’ve got peer-to-peer potential through social media, which is challenging to the banks because it may disintermediate them. What’s good about this for the incumbents is, as you note, we can observe what’s happening. Secondly, in many areas you could imagine an ecosystem of players emerging. It’s not going to be just get rid of the old and replace with the new. In finance, you’ll see that. It’s unlikely due to compliance and regulation that all the banks are going to disappear. But what might happen, and we see this happening already, is partnerships between banks and small startups, or acquisitions of the like or relationships of that sort. Whole ecosystems may compete, but both have to combine. Same thing in the auto industry. Knowledge@Wharton: It means the companies have had to shift quickly on their expectations, their growth strategy, what their focus is 10, 15 years down the road. There are so many other competitors trying to get into specific sectors and surpass what something like Google or Amazon have done. Chaudhuri: Yes, I agree with you entirely. A lot of it is about shifting mindsets. It’s always been like that when you have a challenge. I want to give credit to the participants of a conference we hosted at our San Francisco campus last year on digital disruption. The participants there informed a lot of this white paper. The insight that came from it is that, indeed, you have to shift your mindset. But more than that, maybe reshift the priorities and mission of the firm. Nissan, for instance, thinks of itself more as a mobility solutions company now as opposed to a carmaker because the way people consume cars or use them might change in the era of autonomous vehicles and ride-sharing. They have to re-conceptualize what they do and add the services for it. Knowledge@Wharton: You mention Kodak and what they could have been if they would have made the shift to digital and not continued to rely on the traditional film camera. They had the technology waiting for them, ready to advance it, and they didn’t do it. Chaudhuri: Yes, that’s part of the pain. Oftentimes the innovators are the ones that come up with things. The auto industry has that example, too. GM and others were the ones who worked on alternative sources of fuel. It was the Japanese makers who really took that and commercialized it. But coming back to Kodak, that’s the classic example of disruption. We go back to it not only because it displays all the dynamics of the difficulty — we call it the inertia of not only observing but also reacting to the changes — but it was literally a digital disruption because we moved from chemical imaging to digital imaging. This played out over about a decade. The power of digital didn’t really come into being in photography until we got the internet because then sharing became more important than image quality. What’s unique about that case, and why it was both sad but also gives hope, is that Kodak could have responded at many junctures. The other example here is Blockbuster and Netflix. It’s been a number of years now since we’ve had Netflix around. But it’s not that old in the grand scheme of things. Blockbuster had the opportunity to buy Netflix at one point, but they chose not to. Their offering online didn’t work out. Netflix did, and that’s more the decision-making that led to problems. Knowledge@Wharton: Let’s just theorize for a second that Blockbuster does buy Netflix. Does that combined entity become as big as Netflix is now, or would the structure that Blockbuster had in place taken down both of them? Chaudhuri: You’re getting to a subject that’s close to my heart, which is external sourcing of innovation. Whether you do partnerships or acquisitions, it’s not easy to implement those. If they had not been able to manage them properly, that would have been an issue. So, it’s not that simple. You’re getting to another underlying point I want people to realize, which is that we often talk about these incumbents who fail. RIM with BlackBerry is another example, and Nokia and Borders and the like. But it’s not about managerial stupidity or foolishness. It’s about how do we respond, and it’s tough. It’s about trade-offs. If you’re an established firm, you’ve got customers, you’ve got standards, you’ve got scale. You can’t just leave all that aside and go after every new thing, especially because it’s hard to distinguish the noise from the actual signal. There are thousands of new ideas and promising new things that come — 999 of which won’t go anywhere. Knowledge@Wharton: BlackBerry has shifted to being more of a technology company. Do you think they can do that and be that strong company they were 15 years ago? Chaudhuri: That’s a great point. Reinventing yourself and how you transform in the face of these challenges — there is no one answer or right answer. What’s sad about the BlackBerry case is that they had the corporate market, which is the lucrative one, and people still love the keyboard. Apple originally was a consumer company. They made a lot of money; that’s what they’re good at. BlackBerry could have just simply learned how to do the good features from Apple and perhaps kept the corporate angle, which people loved so much. Many people, myself included, moved to the touch screen, but we really loved for email purposes the keyboard. Now on the positive side, the firm has got a lot of patents and technologies. It’s got a focus on software now. It was always much stronger because of its corporate focus on the security side, which is key in smartphones. I think your point is very valuable. The way we define core capabilities in a company is very fundamental, so it’s not necessarily to do with products and services. BlackBerry could have a good future. Look at IBM. IBM started as a computer maker. They sold their PC business to Lenovo and even sold their server business and have refashioned themselves as an e-business company. We don’t use that term anymore, but really to be a service provider for all these global corporations takes a lot of guts. Knowledge@Wharton: General Electric also shifted from being in retail, selling light bulbs and fixtures, to what they are now. They’re very big in the digital space. They’re a great example of how you go about embracing change. It makes you think about whether we could see a recovery in manufacturing if a lot factories are making that shift to the internet of things. Will we see that growth come back at some point? Chaudhuri: Yes. There’s a whole political debate around this, which I don’t want to get into, but what I will say is I think that manufacturing is going to enter a new age. We’re moving to automation. We’re moving into smart factories. This is the advantage that the advanced economies have because not everybody can be in the services sector. Not everybody can go to Silicon Valley and be a programmer or work on the latest app or work at Lyft or wherever. Whether in 3-D printing form or otherwise, we will have manufacturing. It might be smart manufacturing and a lot of robots in there, but we will need people to do that. I absolutely think it’s necessary to move to that level. Germany has something called Industry 4.0. A number of firms are moving in that direction. Smart factories are a big priority that’s mandated by Germany. All these big manufacturing powers are looking to really strengthen and advance and move to the next level. I fully agree with you. Knowledge@Wharton: But also talk about how mobile technology has invaded this sector. We all live on our smartphones, so mobile technology has the opportunity to have so many of these sectors explode over the next decade or two. Chaudhuri: Absolutely. Mobile has become the ubiquitous medium that has enabled so many things — whether it’s communications connectivity around the world, including the emerging markets, but every single application you can think of. We can monitor your vital statistics and help you manage your health better, especially if you have a chronic disease. The health care firms and the patients are benefitting from that. We’ve got apps to do all kinds of things. And now look at a different area: financial inclusion. In emerging markets — take China, India and Africa — it would be tough to build up the banking infrastructure like we have it elsewhere. By having the mobile medium, you can have essentially virtual banks and peer-to-peer lending, even by the traditional banks, and cover that so beautifully. Just like the internet for us was absolutely revolutionary — and you and I got to see the pre-internet era and the post era — mobile is doing the same thing, which is why a lot of firms like Facebook and others are shifting more of their effort now in the mobile platform. Knowledge@Wharton: How much do you think we are going to see growth come because of mobile in other parts of the world, places like Africa and South America where we have the opportunity to use that technology to build up many different pieces of economies? Chaudhuri: I think that’s going to happen, and we already see it happening. In fact, Kenya is one of the leaders when it comes to banking on mobile platforms and applications in simple ways through SMS, text messaging and the like. I think that’s absolutely going to enable the world to be more connected in these applications. There’s no doubt about the potential of this technology and this platform, more importantly. Knowledge@Wharton: You talk in the paper not only about the companies being the innovators but the companies taking advantage of their consumers, who are another level of innovator for them. Chaudhuri: Yes, and you can look at that in multiple ways. Users provide a lot of data and information. We can aggregate all that information from these apps based on your usage. That’s what these Ubers do, that’s what the Amazons do to recommend things to you. That’s what all these health care apps do to improve your lifestyle. That’s more of a process side. In terms of product, we have that, too. A great example of user innovation is Lego, which may be more familiar to people. You can send them your ideas, and that’s really powerful. It’s part of this iteration. We were talking about earlier how things are moving fast now in the era of disruption. All the sources you can get in your ecosystem — your stakeholders, your suppliers, your customers, maybe even competitors — they are very much a part of this exercise. And it has to be iterative. You can’t foresee the world and where it’s headed; you have to respond and react quickly. Knowledge@Wharton: One of the big topics with companies right now is shareholder value. Are we seeing conflict between what the shareholders expect and what the company expects? Chaudhuri: This has been an age-old question: To what extent can shareholders see the long term? That’s really the problem with this quarter-to-quarter system and the pressures on the CEOs. I think, though, that shareholders are a little bit open because they, too, realize things are moving very quickly. When GE says, “Listen, it’s going to take us 10 years to figure out a solution on energy,” or “It’s going to take us three years to really get these IIOT (industrial internet of things) initiatives going before you see the actual returns,” they’re willing to go with that. I think what’s important for shareholders is you actually come up with revenue streams. Google’s challenge has been that they’ve got the search business and related businesses, and all of it is geared towards advertising. They have one business model. They make some money off of the website and Android site. But it’s others, like the handset makers and the service providers, the AT&Ts and T-Mobiles, who make a lot of the money and capture a lot of that value. So, they’ve been looking for ways to commercialize a lot of cool products and services. That’s why it was very smart for Google to divide into the mainstream Google and have the Alphabet portions, which don’t yet have the commercialization ability. Cisco is another great example. It’s a great firm, a total market leader when it comes to telecom solutions and leveraging external sources of innovation like acquisitions very well. But in the era of software invading the networking space, they’ve got to reinvent themselves. They’ve got to strike that balance, you know? How do we keep the cash flow going today but also show we’re active in cloud, on the software side, and in other areas we need to be to remain in the market-leading position in the future? Knowledge@Wharton: Going back to the example of how IBM shifted from being a computer retailer to what they are now, what’s that industry going to look like? We all have a smartphone or a laptop or a tablet, so are the companies that make PCs going to morph into what IBM has tried to do over the last decade? Chaudhuri: Absolutely, because what you see is the convergence. It’s not clear to us in the internet of things, where everything’s connected, whether it will be the software platform manufacturers who will dominate. Will it be the hardware makers? Will it be the chip manufacturers? Everybody’s vying for that, and they’re working on that. Let me take that vision a little further. I see no real reason for us to have a tablet and a laptop and a smartphone. The only reason is physical limitations. As soon as the materials are there and improved, you’ll be able to unfold your smartphone so it has a keyboard and a larger screen and use it as a laptop and as a tablet. Then you can fold it all up, stick it in your pocket again and go about your business. I’m waiting for that day. Knowledge@Wharton: We talked about the importance of the consumer and how they can be an innovator in this process. But that takes the company understanding and listening to the consumer and improving what they do. That’s one of those core things that really hasn’t changed over the years. Chaudhuri: No, it hasn’t, and why it’s important is that today data supports us. It’s not me necessarily observing what you’re doing in physical form, but it’s about me gathering all your data about your usage and then tailoring products and services on that basis. But there is a limitation. The limitation of users is they don’t necessarily see what’s far out there. There’s a limitation to what we can envision. That’s where the ingenuity of someone like a Steve Jobs is necessary, who dangles something like an iPad, which got very negative reaction initially. People said, “Oh, that’s just a bigger iPhone.” Then you start seeing how you might use it. He had the vision to see what might be out there. So, the truly revolutionary changes that are going to happen will still be a bit more push than pull. Then they can be informed and refined by and with the customers. It’s the company that will have to take a fundamental role, still. Knowledge@Wharton: You have a section in the paper titled “Innovate Innovatively.” What does that mean? Chaudhuri: It was meant to be catchy, but the point is about ultimately how any organization is going to stay ahead. It’s not possible to predict the future and where things are headed. It’s more important to track what’s going on and adapt. The message that we want to send is it’s OK to leverage all kinds of sources. Procter & Gamble had this crowdsourced model called Connect + Develop in order to get problems solved by chemists and scientists around the world. Cisco buys a lot of firms. Intel has been good at investing in firms. Google and others do the same thing. It doesn’t just have to be your own in-house engine. You can’t come up with every new technology or every new capability yourself, so you have to look outside. The challenge with it is you have to be good at everything now. You have to be good at deciding, “Here’s when I use organic, here’s when I use partnerships, here’s when I use acquisitions.” And you have to be good at implementing them, so you really have to innovate innovatively. Ultimately, if your processes and your organization are not up to the task, then even with the best strategy of wanting to stay ahead of the curve all the time, you won’t be able to execute on it. This article also appears on the Knowledge@Wharton website.